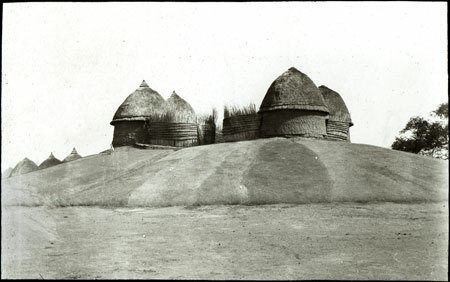 The homestead mound (Aturwic) of the Shilluk king at Fashoda, with his compound of four huts built on top. The mound was said to have been built by the tenth king, Tugo. The Shilluk king (Reth) was a highly important figure in Shilluk society, thought to be the incarnation of the nation founder Nyakang. Manual catalogue entry (thermofax catalogue copy in folder '27-06 Seligman Slide Collection') - "V.e.48. Palace of Shilluk king, Fashoda"
Note on lantern slide ms ink - "V.e.48. Shilluk village near Fashoda. CGS. 273"
Morton, Chris. "Shilluk king's homestead" Southern Sudan Project (in development). 03 Jan. 2006. Pitt Rivers Museum. <http://southernsudan.prm.ox.ac.uk/details/1967.26.195/>.